Without doubt, Leo would want us to have a great tool at the right price. Mission accomplished. Plenty of Leo's DNA, great build, well set-up vibrato and great sounds. Oh, and plenty of options. Very little, but making the right choice of options for you is the key here. It was back in 1983 that G&L- formed in 1979 by George Fullerton and Leo Fender - first launched a cute little retro-rocker called the SC-2. Loaded with two single-coil pickups, the SC-2 was accompanied in the G&L adverts of the day by the single-pickup SC-1 and triple-single-coil-toting SC-3. The SC models have since become a bit of a cult fixation, and the uncluttered slab body of the early guitars makes it a cracking little platform for customisation. Now, that chassis forms the basis of the USA Custom Shop Fallout model, a guitar that can be ordered as a bespoke spec build from the G&L workshop on Fender Avenue in Fullerton, California. its body design go way beyond the birth of the SC guitars. Design-wise, Leo Fender wasn't starting from scratch when he formed G&L, as the aesthetics of the firm's better known ASAT Special testify. "We see the unmistakable influence of the short-scale Fender student models of the 50s and 60s on the Fallout's lines." In this case, we see the unmistakable influence of the short-scale Fender student models of the 50s and 60s (the Duo-Sonic and its vibrato-loaded brother, the Mustang) on the Fallout's lines. Focusing on the spec list, proceedings kick off with an alder body with rear ribcage contouring and a flat front, top bound in white. The whole thing is finished in a flawless Ruby Red Metallic, while white pearl scratch and backplates constitute the plastic parts. The chrome Dual Fulcrum vibrato stands guard over the body like the hood ornament on a classic motor. Moving on to the pickups, you get a Seymour Duncan TB-4 humbucker in the bridge position, wired to a coil-splitter, and the house P-90 at the neck. The wiring loom is a simple layout of chrome-knobbed master volume and master tone controls and a three-way pickup selector toggle switch, while the aforementioned coil-split is engaged by pulling on the tone knob. The Fallout has a full 648mm (25.5-inch) scale neck, formed from hard rock maple and attached to the body with four screws. The matching hard rock maple 'board has a 305mm (12-inch) radius and 22 medium-jumbo frets, their positions marked with black dot inlays. Aside from all that, you get a well-cut bone top nut and a set of non-locking Sperzel Standard satin silver tuners. The body, neck and all their constituents add up to a sturdy but manageable weight of 3.6kg (7.9lb). While our Fallout is making us twitch in all the right places, we did mention earlier that you can order your own custom-made example, with a delivery time of nine to 12 weeks. The base price of the fixed bridge, non-bound Fallout is £1,387. Our guitar includes the DF vibrato unit (£105) and the white top-body binding (£133). Among the many options, you can choose locking tuners, a Graph Tech nut, along with a range of standard finishes like Sonic Blue or Belair Green. There's anup chargefor translucent premier colours (£88) and metal-flake hues (£133). A call to G&L's distributor or a visit to the website will help you initiate your dream spec. There are too many options to list here! Yes, the Fallout and its SC series predecessors share some DNA with those increasingly valuable Fender studio models. That said, you can see the ghost of the original Volkswagen Beetle in the profile of a Porsche 911, and they're both very different machines. So, while the Fallout has some of the vintage curb appeal of its ancestors, its playability and feel are thoroughly modern. The neck has what the Custom Shop team describes as a classic 'C' profile. In practice, it feels pleasantly plump, and increasingly so as you make your way to the 12th fret. It's one of those necks that feels like it would appeal to just about every guitarist. The medium-jumbo frets have been Plek'd to perfection, too. There are no rattles, buzzes or dead spots, and even extreme string bends above the octave ring clear and true through our amp. "While the Fallout has some of the vintage curb appeal of its ancestors, its playability and feel are thoroughly modern." Plugging in, our old pal the Seymour Duncan JB roars into life, here in its TB Trembucker guise. It behaves beautifully in its alder surroundings, bright and punchy as ever, with great note separation even in a high-gain scenario. It can, however, get a little raucous with extreme distortion, so perhaps notch back the amp's mid control to sweeten things a little. Running the JB in coil-split mode adds a reasonably authentic Strat-y tone to the Fallout's arsenal. It wouldn't trick Hank Marvin in a blindfold test, but for country licks and stinging blues, it works a treat. Used both in combination with the JB and solo, the neck P-90 offers a pleasing level of warmth and clarity when clean and a rich, sustained singing voice with some overdrive engaged. A full-size humbucker and a P-90 can look like a weird combination on a guitar, but they don't half make for a versatile team. We have a lot of love for Fallout's Dual Fulcrum vibrato, too: a chunky beast that somehow manages to feel unobtrusive. It's set up for a bit of pullback, but unlike many floating vibratos, you can palm-mute this one without knocking the tuning sharp. Factory fitted with 0.010 to 0.046 gauge strings, the unit itself doesn't wobble dramatically when you attempt doublestops or pedal-steel licks. Plus, dive-bomb or dump the strings down on the pickups and we find that the guitar holds its tuning perfectly. 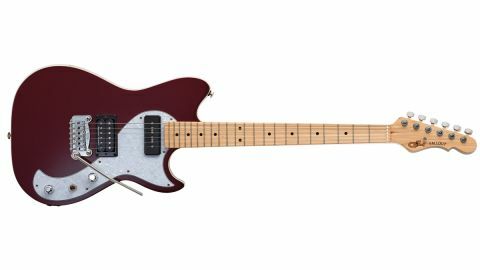 The idea behind the custom-build Fallout was to imagine what the late Leo Fender would have done with the SC guitars if he was designing them today. We think our Ruby Red Metallic example answers that question, with its flawless build quality, exceptional playability and wide tonal palette that would suit anyone from country pickers and jazzers to studio jobbers and metalheads.